General Manager, Space Systems Division, Mitsubishi Electric Corp.
"On March 7, 2011, the contract for building two communications satellites �gTurksat -4A�h and �hTurksat-4B�h was awarded to MELCO by Turkish national satellite communications company,�gTurksat Satellite Communication, Cable TV and Operation AS�h. For MELCO, this contract was the next award after �gST-2�h communications satellite of 2008 from SingTel (Singapore) / Chunghwa Telecom (Taiwan). It will be the tenth satellite which uses our standard satellite bus �gDS2000�h. During the proposal phase, a great deal of support was given by Japanese government agencies and related organizations, which was a strong back up for the contract award. On this occasion, we would like to express our appreciation to the concerned entities for the support." Mr. Inahata, General Manager of Mitsubishi Electric Corp. talks about the present status of overseas space business of his company. "The last 10 years have seen an explosive growth of UAV research and development as well as operational deployments by the United States. The primary driver of all UAV systems has been military funding. With the exception of some demonstration programs, use by commercial operators or local governments, have been postponed due to costs. NASA operates a small number of research vehicles derived from the currently used military systems. No significant system development exclusively for commercial or scientific users is underway...."
"For centuries, human beings have dreamed of traveling to the stars. The development of rockets in the 1940s intensified the interest in space travel, which had been popularized in the nineteenth century by science-fiction writers such as Jules Verne. The commercial movie industry began capitalizing on the concept of space travel in the early 20th century; the launch of Sputnik in 1957 and Yuri Gagarin�fs flight shortly after in 1961 further boosted the world�fs fascination with space flight. Today, outer space-related science-fiction movies and books continue to be money-making ventures...."
"This book was written by George Friedman, founder and CEO of STRAFOR that has the nickname of �gbehind-the-scenes CIA�h, and is a sequel of �gThe Next 100 Years�h reviewed in April/May 2011 issue of Space Japan Review. Whereas �g The Next 100 Years�h handled the forecasts on America and the world for the coming century, this book discusses the forecast on the next ten years which are more realistic for us all. Therefore, the author argues the America�fs policy enthusiastically, slightly different from the usual forecasts. It is interesting that this book can be read like the special instructions for the U.S. President..."
"Moreover, to found and support the Silicon Valley was the space development of the U.S. From mentioned above, I recognized that the reason why IT ventures have not grown up is because full-scale space development had not been performed as well as systematic accumulation little exists in our country. What do you think?" Yoshihito Shimazaki, SoftBank Mobile Corp. 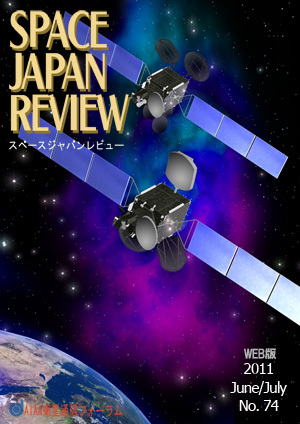 This report expresses restoration process in SoftBank Mobile's cellular-phone infrastructure after the Great East Japan Earthquake, March 11, 2011. "I think I took olds. I received two presents from AIAA recently that might show a good care of AIAA. Based on the argument in the SJR editorial committee that had better report to all of readers, I report below briefly. As for the first present, I received a certificate signed by the AIAA President to commemorate the years of service on my 25th anniversary of continuous membership in the AIAA, as shown to the right. I became a member of AIAA in 1986..."
ICSOS 2011 was held In Santa Monica, California, USA from May 11 to 13, 2011. This article reports the conference.